According to Health minister of South Africa, there are around 94,000 schoolgirls were pregnant during the 2011 year and 77,000 from them had abortions. 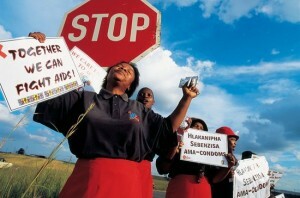 More than 10% of South Africa population, 5 million, is HIV positive (official statistics). From 2009 South Africa runs the largest anti-retrovial campaign since the president appointed Mr. Motsoaledi as a Health minister. Before 2009 only 678,000 of HIV positive people received life-saving anti-retrovial drugs but now this number is almost 1.5 million. Mr. Motsoaledi said that the large number of HIV positive schoolgirls ‘destroyed his soul’. Everyone knows that it is not young boys sleeping with these girls, it is old men – ‘sugar daddies’. The country should strengthen measures against sugar daddies. Also Health minister said that some pregnant girls aged between 10 and 14 years of age are also living with HIV. Almost half of all those who died in the country died because of Aids, 260,000. “It is clear that it is not young boys who are sleeping with these girls. It is old men. We must take a stand against sugar daddies because they are destroying our children. 77 000 girls had abortions at public facilities. We can no longer live like that. We want to put an end to it.” – Mr. Motsoaledi.